The way people read album reviews these days, we can assume the majority of you looking up the latest Wave Pictures album, or more accurately double album, will be familiar with the band. So let’s skip a few of the usual platitudes, such as the one about singer and guitarist David Tattersall – he’s a highly intricate lyricist, swayed by the small details in life with a passionate and marked delivery. Let’s also move past the notion that fellow players Johnny Helm on drums and bassist Franic Rozycki are the strongest backbone you could hope for in a three-piece indie-rock band, unsurprising over the band’s lengthy discography which numbers somewhere around the 12 album mark. And let’s lightly brush over the fact that Tattersall’s approach to guitar playing is inventive, often drifting towards the outlandish as he gets entranced by his own widdling, usually at least once or twice a song. We can move beyond that awkward turn of phrase too if you like. City Forgiveness is the band’s seventh label album since 2006, keeping up their twelve-monthly cycle, and it was written on their most recent tour in the US with Allo Darlin’. On first look it’s a strange match-up; Allo Darlin, though singer Elizabeth Morris‘ lyrics may take an often wayward tone, are perpetually upbeat while the Wave Pictures often veer towards the morose. However, the tour has far from affected the Pictures’ excellent handle on the downbeat, shown in respective closures of the 2-disc set; ‘Tropic’ and ‘Like Smoke’, but also elsewhere on tracks like ‘A Crack in the Plans’, where Tattersall describes “clouds of sulphur over the very thing that means the most to you”. These tracks guide the listener through the record, sprinkled amongst the more punctuated up-tempo numbers, expertly drifting between nonsensical (“I stared a fox in the face in the shadow of a burger stand”) to the descriptive (“In my room underneath the sparrow’s nest, your teeth by contrast look pure white”). Wave Pictures have a number of well-known friends and collaborators, perhaps French band Herman Dune being the most familiar, and while it’s inevitable that the band will pick up and deliver in a similar style from time to time, tracks like ‘New Skin’ reek of classic Herman Dune – circa 2002, before the departure of founding member and guitarist Andre Herman Dune. 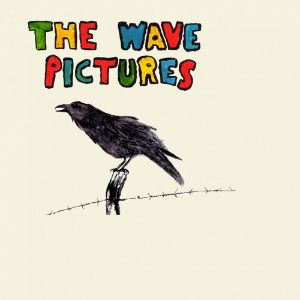 It’s a dark, moody tale-telling, held together by two wandering guitars that will be familiar to Dune fans, but it’s the multiple guitars that the Wave Pictures have avoided on recent releases. Long Black Cars, the Wave Pictures’ 2012 album was recorded with a single mic atop the drum kit, while, like other albums, much of the vocal and guitars were performed live. However, City Forgiveness, despite its length and wandering style, which flip-flops between upbeat rollicking and downbeat drudgery, is delivered in a much more coherent style. For the first time, the band sounds like more than the sum of their parts, feeling at points like a bonafide four-piece. Much of this is thanks to Tattersall who, while letting rip on the guitar in familiarly rambunctious ways on the longer 6-minute numbers, of which there are surprisingly many, has re-evaluated the approach to his traditional songwriting process by presenting songs that make much more of a spectacle of two guitar lines. They also continue to give drummer Johnny Helm audible breathing space as he takes up the vocal reigns on the surprisingly piano-punctuated ‘Atlanta’ in which he talks of “the water going down the drain, these are the days that will drive me insane”. While he hasn’t quite reached the peak of his first Wave Pictures vocal outing, the b-side ‘Now You’re Pregnant’ in which he asides that the death of Johnny Cash is not like Elvis, ‘Atlanta’ is a clear sign that the three are getting more and more comfortable with a second lyricist and vocalist – on more recent records it has sometimes felt like a novelty experiment, though clearly not the intention. Though describing the record as being written in a short and of course poignant time in the band’s career is an easy PR cliché to boost the story behind the story, the band has assembled this set of songs incredibly well, rather than splitting the upbeat from the downbeat, the pop from the dour, they choose to mix the ups and downs together, leading the user through the album’s 90 minutes, already a huge commitment, in a way that illustrates the twists, turns, bends and winds of a long tour, in a surprisingly effective manner. Without doubt, this is a wildly entertaining travel diary in pure musical form. Dear Hollyoaks… I’d like to apply to the position of script editor?